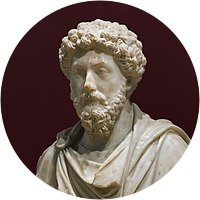 A collection of the best Marcus Aurelius quotations. Fate finds for every man his share of misery. A man is a little soul carrying around a corpse. A man must stand erect, and not be kept erect by others. O world, I am in tune with every note of thy great harmony. Have I done an unselfish thing? well then, I have my reward. It is a man's peculiar duty to love even those who wrong him. Waste no more time arguing what a good man should be. Be one. All is temporary and ephemeral — fame and the famous, as well. Check impulse; quench appetite; keep reason under its own control. Whatever may befall thee, it was preordained for thee from eternity. Nothing happens to any man which he is not fitted by nature to bear. Let thine occupations be few, said the sage, if thou wouldst lead a tranquil life. Remember the sole life which one can lose is that which he is living at the moment. A rational nature admits of nothing which is not serviceable to the rest of mankind. Ask yourself daily, to how many ill-minded persons you have shown a kind disposition. Do not be sick or despairing if you do not always succeed in acting from right principles. Choose not to be harmed — and you won't feel harmed . Don't feel harmed — and you haven't been . Be satisfied with success in even the smallest matter, and think that even such a result is no trifle. Every man values himself more than all other men, but he always values others' opinion of him more than his own. Opinion is the main thing which does good or harm in the world. It is our false opinions of things which ruin us. Remember this—that there is a proper dignity and proportion to be observed in the performance of every act of life. The characteristic of the good man is to delight in and to welcome what befalls and what is being spun for him by destiny. Everything is fruit to me that thy seasons bring, O Nature. All things come of thee, have their being in thee, and return to thee. The first rule is to keep an untroubled spirit; for all things must bow to Nature's law, and soon enough you must vanish into nothingness. Never let the future disturb you. You will meet it, if you have to, with the same weapons of reason which today arm you against the present. How much time a man gains who does not look to see what his neighbor says or does or thinks, but only at what he does himself, to make it just and holy. Concentrate every minute like a Roman—like a man—on doing what's in front of you with precise and genuine seriousness, tenderly, willingly, with justice. And on freeing yourself from all other distractions. Yes, you can—if you do everything as if it were the last thing you were doing in your life, and stop being aimless, stop letting your emotions override what your mind tells you, stop being hypocritical, self-centered, irritable.